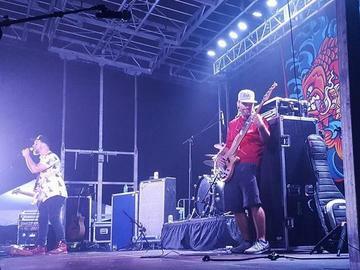 For one night only on Saturday, September 22 – catch BADFISH, a tribute to SUBLIME right in Dartmouth! Thanks to Miller Lite, BASK, and Brennan's Smoke Shop, we’re bringing Badfish into town and you and the gang are invited! This is an all ages show in an outdoor setting so sing as loud as your little heart desires. Who: Badfish, a tribute to Sublime playing to a field full of people who love Sublime- all ages. Get there early and catch our show opener Most Dangerous Men Alive at 6:30p. Where: Running Brook Vineyard & Winery, 335 Old Fall River Road, Dartmouth (map here). Carpooling is STRONGLY suggested and chairs and blankets are welcomed. No bags, outside food, drinks or dogs allowed. Security reserves the right to check for items at the gate. When: Saturday, September 22. Gates at 6pm, show at 8pm. RSVP to our Facebook event page and we’ll keep you posted in case you’re forgetful or anything changes. Why: Because it was a ton of fun last year! RBV is just 5 minutes from the Dartmouth Mall so think of how quickly you’ll be home once its over. Tickets: $20 per person in advance; all ages. You can buy them online or at the Fun107 Studios during normal business hours, cash only.. Any available tickets will be sold at the gate for $25 the day of the event. Other Stuff to know: This is grass field parking, heavy trucks run the risk of sinking into the ground if the ground is wet from the week prior. Again, Carpooling is strongly suggested. Food trucks will be on site and proper IDs will be needed to drink.